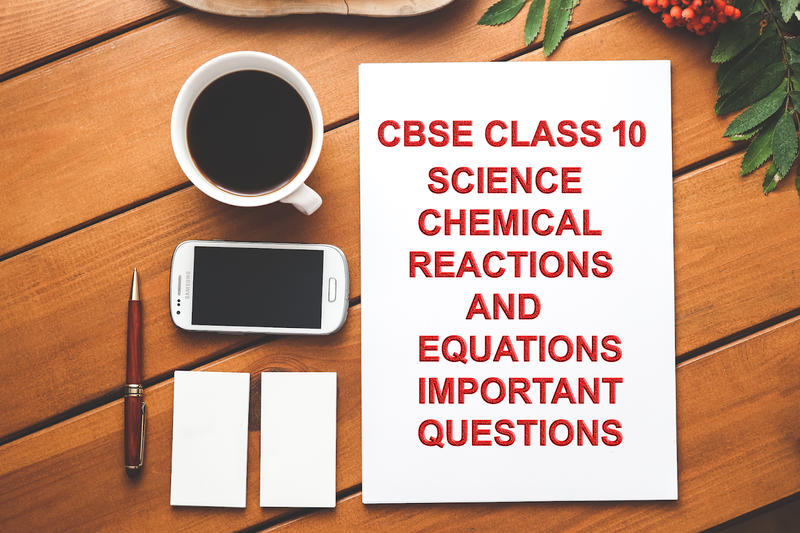 Chemical Reactions and Equations is the first chapter of CBSE Class 10 Science.In this chapter you are going to study about Chemical Reactions, writing of balanced chemical equations, Types of Chemical Reactions, Corrosion and Rancidity. This chapter has 5- 6 marks weightage in Board Exams. Here we are going to provide you the most Important Questions of this Chapter for Board Exams which are prepared by Experts. 1. Write a chemical equation of double displacement reaction. 2. Why is respiration considered an exothermic reaction ? 3. Identify the chemical change: melting of ice or conversion of milk into curd. 5. What changes do you observe in the iron nails and colour of copper sulphate solution, if iron nails are dipped in CuSO4 solution for 15 minutes ? 7. Potato chips manufacturers fill the packet of chips with nitrogen gas. Why? 9. What happens when milk is left open at room temperature during summers? 10. Why does apple pieces become reddish brown if kept in air for a long time? 11. What happens when quick lime is added to water ? 1. Define combination reaction. Give one example of combination reaction which is exothermic in nature. 2. What is decomposition reaction ? Explain with the help of an example. 3. Name and state the law which is kept in mind when we balance a chemical equation. 5. What is rancidity ? Write two ways by which it can be prevented. 6. What are two conditions which promotes corrosion ? 7. A small amount of ferrous sulphate is heated in hard glass tube. (a) write the chemical equation. (b) what type of reaction is taking place. 8. What happens when Zn strip is dipped in CuSO4 solution ? 9. What happens when dilute HCl is added to iron fillings ? (a) white silver chloride turns grey in sunlight. (b) brown coloured copper powder on heating in air turns into black coloured substance. 3. A metal salt mx when exposed to light splits up to form metal m and gas x2. Metal m is used to make ornaments whereas gas x2 is used in making bleaching powder. The salt mx is used in black & white photography. 4. A metal strip ‘x’ is dipped in blue coloured salt solution ySO4. After some time a layer of metal ‘y’ is formed on metal strip ‘x’. Metal ‘x’ is used in galvanization whereas metal ‘y’ is used for making electric wires. (a) what could be metal ‘x’ and ‘y’ ? (b) name the metal salt ySO4. (c) what type of chemical reaction takes place between x and ySO4? Write the balanced chemical equation. 5. A white salt on heating decomposes to give brown fumes and a residue is left behind. (b) Write the balanced chemical equation. 6. A zinc plate was put in a solution of copper sulphate kept in glass containe. It was found that blue colour of the solution gets fader and fader with the passage of time. After few days, when zinc plate was takenfrom the solution a number of holes were observed on it. (a) State the reason for changes observed on the zinc plate. (b) write the chemical equation for the reaction involved. 1. White wash was being done at Vikas’s house. Vikas saw that the painter added quick lime to drum having water. Vikas touched outer surface of drum, it is unbelievably hot. (d) dil. hydrochloric acid is added to copper oxide to give green coloured copper chloride and water.